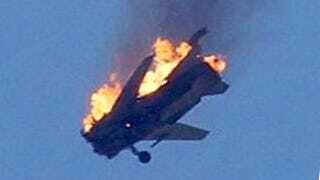 It appears that the Syrian Air Force has lost another of its prized Su-24 Fencer swing-wing attack jets. Some incredible photos and video popped up today showing the shattered aircraft falling to the ground while streaming flames, though there is no word yet on the status of the pilot. It is not clear exactly how the aircraft was shot down, although by looking at it these images, the jet was basically broken in two. This would be indicative of either a direct hit or a very powerful proximity explosion. The supposed location of the shoot down is also suspect, as Dara’a Governorate lies very close to both the Jordanian and Israeli borders. It is not impossible to think that the Su-24 could have strayed into, or very near either country and was shot down as a result. Syria is thought to have had only 22 Su-24s at any given time, coming from 20 examples that were delivered from Russia in the late 1980s, and another two that were donated by Libya in the mid-1990s. Some of these jets have already been lost during the last half decade of Syria’s civil war. That, combined with known low serviceability rates that plague the Syrian Air Force, makes their Su-24s a dwindling-but-high-demand resource. With the majority of Syria’s Fencers receiving upgrades in Russian to the Su-24M2 standard during the mid 2000s, no other aircraft in the Syrian Air Force’s inventory is capable of delivering as many bombs as far, or as accurately, as their Fencers. Thus losing one is a big deal. Think of it like America losing a B-2 bomber. It is unclear if the Assad regime’s increased use of its best aerial assets is a sign of desperation or increased strength. It also makes you wonder where they are getting parts to fly their Fencers at increased an increased tempo from. Russia or even Iran could very well be the source.